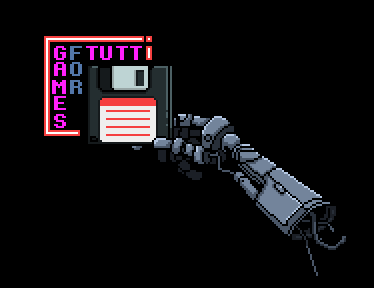 Games For Tutti is a team of indie developers located in Valencia, Spain. The studio is currently working on its second game, Scrap Riders. Scrap Riders is a PC and console adventure set in a cyberpunk future. The game combines elements from ‘old-school’ adventures, with action and fights in a ‘beat-em-up’ style. Be a part of a gang of bikers that live outside the law, and make your way through the wastelads and the big metropolis controlled by the corporations. The world of the future is a cruel place where only the powerful have privileges. To be free you need to live out in the Wasteland. And resources are scarce there. Get to know the members of your gang, talk to the inhabitants in the cities and get rid of rival gangs and the corrupt police. Complete the missions that will allow you to become someone important inside your gang. Drive your motorcycle and fight on the road for the survival of your gang. Discover and uncover the conspiracy that’s behind the robberies. But above all, BE A TOUGH GUY. ’Beat-em-up’ style action, between investigation and adventure. Deep story, with a profound lore to get lost in. Original soundtrack composed especially for Scrap Riders. Evolution and progress of your character.